These ArtCraft covers were created for the 2012 Election and 2013 Inauguration of President Barack Obama. Also included are Election and Inauguration covers from President Obama's first term. These are great historic mementos! Click Here to see Inauguration Day and other Presidential Covers for American Presidents from the 1949 Inauguration of Harry Truman to date. President & First Lady Michelle Obama cachet postmarked Inauguration Day, January 21, 2013. Postmarks available from 5 different cities. President Obama & Vice President Biden cachet postmarked Inauguration Day, January 21, 2013. Postmarks available from 5 different cities. President Obama cachet postmarked Inauguration Day, January 21, 2013. Postmarks available from 5 different cities. This Election Day cachet features the Obama Family and is canceled on November 6, 2012 in Chicago,Il, the Obama's home city. Canceled on November 6, 2012 in Washington,DC, the Day Barack Obama was elected to his second term as President of the United States. President Barack Obama accepted the Democratic Party nomination for a Second Term as President in Charlotte, North Carolina on September 6, 2012. This cover depicts President Obama's acceptance speech. Governor Mitt Romney accepted the Republican Party nomination for President in Tampa, Florida on August 30, 2012. This cover depicts the moment of his acceptance speech. 5" x 7" Portrait card of President Barack Obama, 2013. 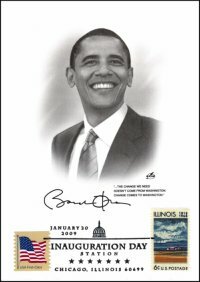 This 5" x 7" President Barack Obama Portrait Card has the 6c Illinois sesquicentennial stamp affixed and is canceled on Inauguration Day, January 20, 2009 with the special Inauguration Day Station, Chicago, IL postmark. 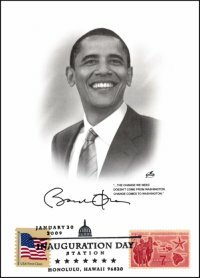 This 5" x 7" President Barack Obama Portrait Card has the 7c Hawaii Statehood Stamp affixed and is canceled on Inauguration Day, January 20, 2009, with the special Inauguration Day Station, Honolulu, HI postmark. This Inaugural cover is canceled with a special Occidental College, Los Angeles, CA cancel on January 20, 2009 - Inauguration Day. 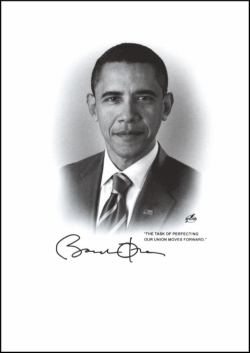 The cover has a specially designed cancel depicting the college seal and "Alumnus Barack Obama." This Inaugural cover is canceled in Wilmington, DE - Joe Biden's hometown on January 20, 2009 - Inauguration Day. It has a specially designed Inauguration Day Station cancel. It is available in each cachet design. This Inaugural cover is canceled in Scranton, Pennsylvania - Joe Biden's birthplace on January 20, 2009 - Inauguration Day. It has a specially designed Inauguration Day Station cancel. It is available in each cachet design. This Inaugural cover is canceled on Inauguration Day, January 20th in Honolulu, Hawaii where Barack Obama was born and spent much of his young life. It has a specially designed Inauguration Day Station cancel and is available in each cachet design. This Inaugural cover is canceled in Chicago, Il, Barack Obama's hometown on January 20, 2009 - Inauguration Day. It has a specially designed Inauguration Day Station cancel. It is available in each cachet design. Barack Obama "Life in Stamps"
The six stamps on this cover tell the story of President Barack Obama's Life. Born in Honolulu Hawaii; graduate of Columbia University; practicing attorney and professor of law; elected to represent Illinois in the U.S. Senate; elected President of the United States. All six stamps are canceled with the January 20, 2009 Inauguration Day postmark. 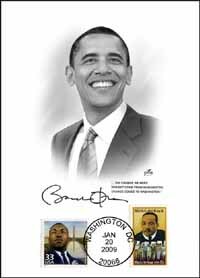 This 5 x 7 President Barack Obama Portrait Card has Dr. Martin Luther King, Jr. and I Have a Dream stamps affixed and canceled on Inauguration Day, January 20, 2009. This 5" x 7" President Barack Obama Portrait Card has a 42c Flag stamp and the 3c White House stamp affixed and canceled on Inauguration Day - January 20, 2009. President Obama & First Lady Michelle Obama cachet with 42c Flag stamp canceled 1/20/09 with Inauguration Day Washington, DC pictorial postmark. Barack Obama & Joe Biden cachet with 42c Flag stamp canceled with 1/20/09 Inauguration Day Washington, DC pictorial postmark. 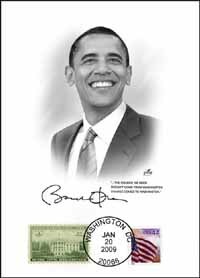 Barack Obama cachet with 42c Flag stamp affixed and canceled with special Washington, DC Inaugration Day pictorial postmark. This cover is canceled on November 4, 2008, in Chicago, IL where Barack Obama gave his victory speech in Grant Park after being elected President of the United States. Canceled on November 4, 2008 in Washington, DC, the day Barack Obama was elected 44th President of the United States. Senator John McCain accepted the Republican Party nomination for President in Minneapolis, Minnesota on September 4, 2008. This special ArtCraft cover features portraits of McCain as an Navy Lieutenant Commander in 1973 and as a Senator in 2008.